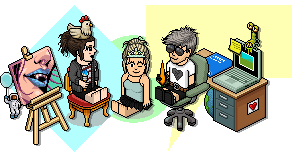 This month Habbo is celebrating all things classic with the release of two new Room Bundles based on classic Public Rooms. One of them, the Classic Hotel View Bundle is already out. See what's included in it on the Wiki page! There's already been 12 different Classic Habbo Room Bundles released since 2015 and you can see all of them, and the exclusive furniture that came with them, on our Classic Habbo page. And later in September 16 teal recolours of everyone's favourite classic rares are set to be released just like in the previous Emerald and Azure Chest Of Lights. Keep an eye on the Wiki when it's released to see what rares the Teal Chest of Light includes! Check out our fabulous wiki!! !